This piece was based on a photograph taken on a visit to the Lavender Fields in Hitchin. 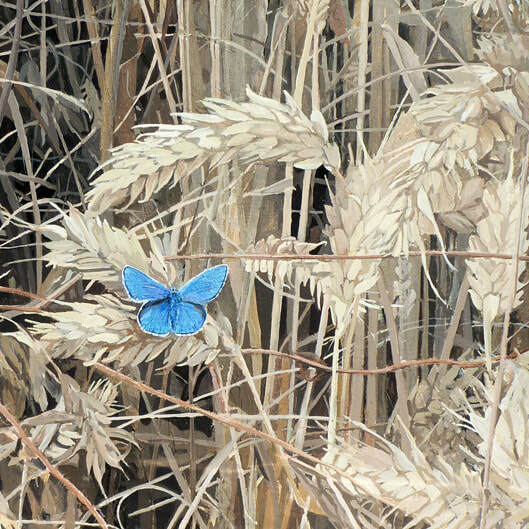 My wife’s fascination for a blue butterfly dancing around a cornfield lead to her taking a series of photos which I based my painting on. I choose a 400mm square canvas and hoped to rattle off a fairly quick piece. Of course getting into it, the striking graphic image demanded a more precise approach. It certainly took longer than I had hoped, but exploring the overlaid shapes was worth the effort. As with any semi- photorealistic approach, when does one stop and call it a day. In this instance I found I needed a majority of areas to look cared for and not obviously brush stroked. When I reached this balance I felt my work was complete. The canvas edges remained quite raw in their detailing, both providing a lead in to the main image on the front and also a hint at the under-painting used throughout.